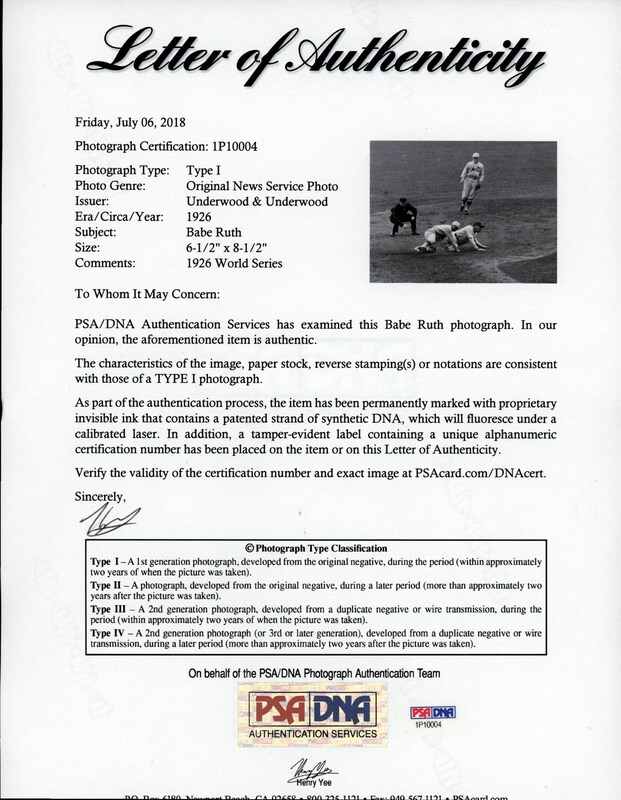 In the classic 1926 World Series, the Yankees would face-off against the St. Louis Cardinals, with the major legendary players being Ruth, Gehrig, Hornsby and Alexander. After five hard fought contests, the Yankees would claim a 3-2 game advantage, coming home to Yankee Stadium needing only one more win to claim their second title. Unfortunately for the Yanks, they would not be able to win that final game in New York, with the Cardinals, led by Grover Alexander's win and save, taking the next two games and World Championship. 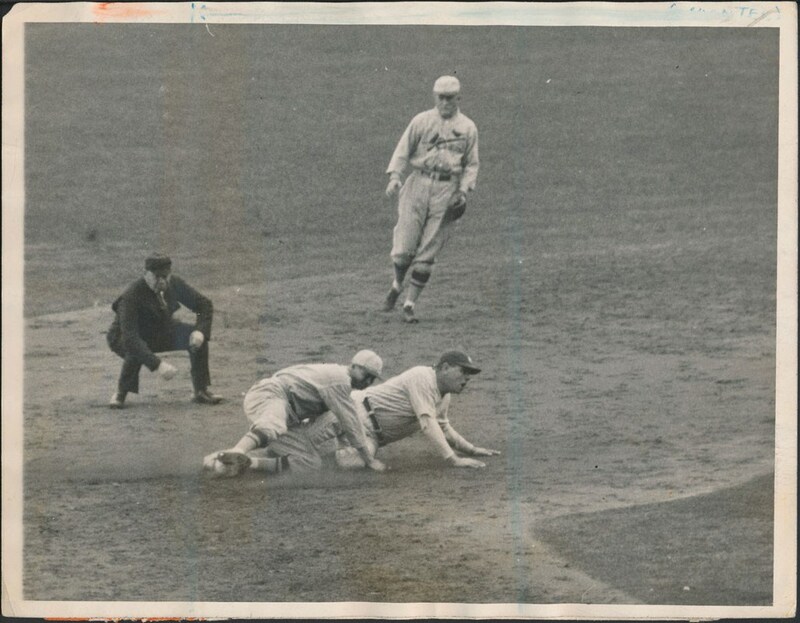 This extremely scarce Underwood & Underwood photo portrays the immortal Babe Ruth sliding safely into 2nd base in the sixth inning of game #6 that the Yankees would ultimately lose 10-2. A rare "candid" illustration, it resides as one of the few action photos you will ever come across from this Fall Classic. Measuring 6-1/2" x 8-1/4", it has retained a majority of its original splendor with the Redbird's HOF 2nd baseman Rogers Hornsby and shortstop Thevenow right in the thick of things. 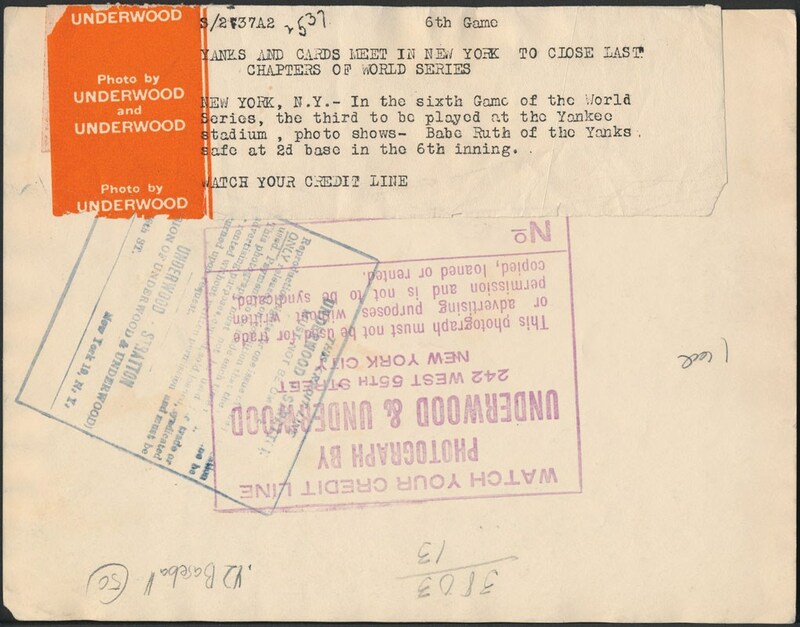 The reverse side caption detailing the play and critical Underwood & Underwood credit stamp are the final exclamation points for this seldom-surfacing keepsake!